CorningWare Colorworks Checkerboard highlights the trendy colors of its cookware with a patchwork of matching color backgrounds. Normally you might aim for a contrasting background. Not so Corning, but nevertheless, with good effect and results. 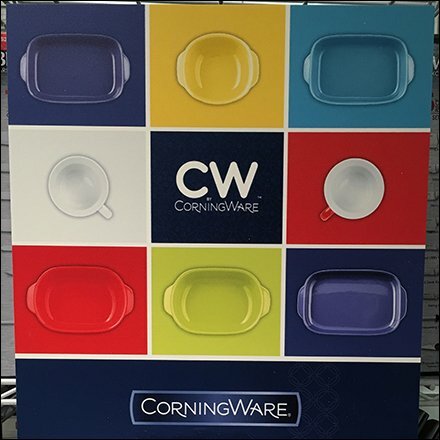 Highly visible from a distance, a cryptic CW brands the display as CorningWare … but only if you come closer. Racking is famous Metro SuperErecta Shelf restaurant shelving in white powdercoat, common outfitting in upscale cookware departments. This CorningWare Colorworks Checkerboard seen at JCPenney.